Teddy Martin–rich, famous, and entitled–is facing murder charges, accused of brutally murdering his wife. His high-powered, high-priced team of lawyers dives into the investigation, determined to prove Teddy innocent. Enter Elvis Cole, the World’s Greatest Detective. Elvis wears Hawaiian shirts and is known to crack the wise. Yet underneath that sometimes irreverent exterior is a hard working, intelligent private eye. Elvis is tasked with proving that LAPD Detective Angela Rossi tampered with evidence in the case. With the help of his partner, Joe Pike, Elvis wades through evidence and witnesses. Soon, he begins to suspect that someone else is involved in tampering with evidence in the case. As Elvis and Joe get closer to the truth, they may find that the truth is more than they bargained for. 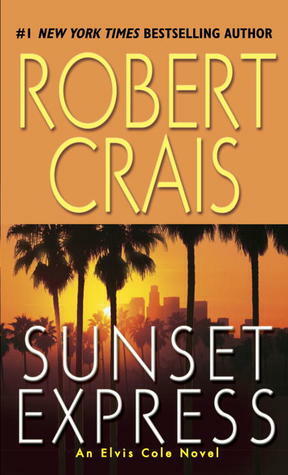 This is book six in the Elvis Cole series by author Robert Crais. If you have not read any of these excellent books, this is a very good book to start with. Not only does Elvis have a compelling case to investigate, but Joe Pike (who is one of my favorite characters of the series) gets some time to shine. Robert Crais’ characters are always complete people, in that they seem to be alive on the page for me. Even the most minor characters have their own memorable spark. The latest Elvis Cole/Joe Pike book was supposed to released in April 2015, but has been delayed until November. So you have time to start from the beginning and read all the books before the new one is available. I adore the author’s work. Mr. Crais, I don’t even mind (very much) that your next title is delayed. When “The Promise” is finally in my hot little hands, it will be a very good day.